Moussaka is recognised as the traditional dish of Greece. I have many happy memories of our times in Greece, sitting in the sunshine looking out over turquoise blue seas, eating this with a Greek Salad on the side and maybe a glass or two of Retsina. If you were lucky the Retsina would be served in a bottle, chilled, but in our early visits there were no such luxuries and it would be decanted from huge barrels into a copper jug. It’s a bit like Marmite, you either love it or hate it and some think it tastes like turpentine. I absolutely love it and have a copper jug at home that I decant the bottle into for authenticity. If I close my eyes I am transported back to those idyllic shores with my first sip of wine. The traditional recipe for Moussaka will include frying the aubergines and using a Béchamel sauce for the topping. 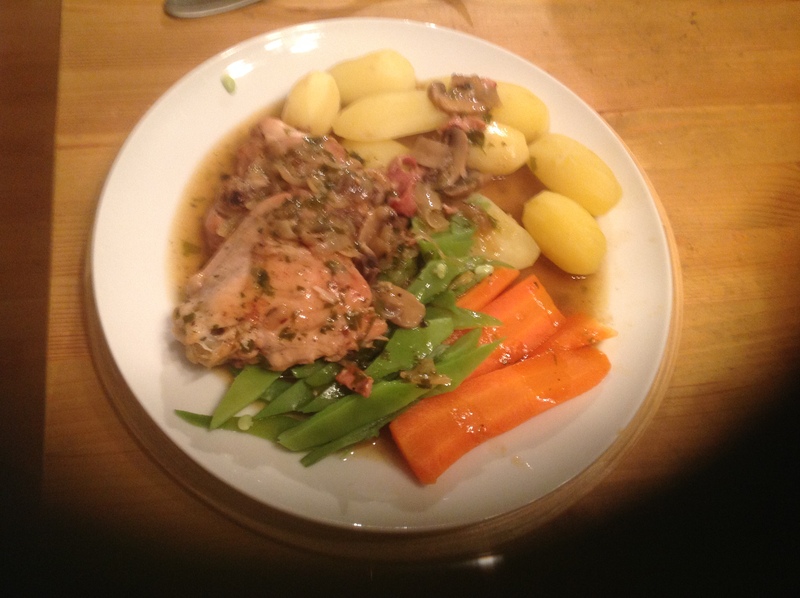 I have adapted this recipe so that it is lower in fat but retains the authentic flavours. Terry’s Greek Grandmother would be mortified but my Slimming World Consultant would give me a pat on the head. Sorry YaYa. If you are using the cheese as your Healthy Option A it is, by my reckoning, Syn free, for those, like myself, who follow Slimming World food optimising. If you want to be truly authentic however, and you are not concerned about the amount of fat in your diet, feel free to replace the yogurt topping with Béchamel sauce although I would still cook the aubergines as below. 1. Bring a large pan of salted water to the boil then blanch the aubergine slices in batches for 5 minutes. Remove and place in a single layer onto kitchen paper to drain. Discard water. 2. In another large pan, spray with one cal olive oil and sauté the onion until softened but not browned. Add beef and continue cooking over low heat until browned, about 10 minutes. 3. Add tomatoes, garlic, cinnamon, allspice and seasoning. Mix well. Add the wine and purée and a little water if it looks too dry. Cover and cook over low heat for about 30 minutes, adding a little water if it is going dry. Remove cover and cook for 15 minutes more to allow excess water to evaporate. You are aiming for a thick meat sauce. Remove from heat and allow to cool slightly. 4. Spray a fairly deep, square ovenproof dish with one cal. Put a layer of aubergines in the base (doesn’t need to be totally covered), followed by a layer of meat sauce. Repeat the finish with a final layer of aubergines. 5. In a bowl, beat the yogurt then beat in the eggs. Add half the cheese. Mix well then pour over top of dish. Sprinkle with remaining cheese then bake in preheated oven (180C/170C fan/Gas 4) for 45 minutes to 1 hour or until the top is golden and base heated through. 6. Remove from oven and allow to stand for about 10 minutes so the top firms up. Serve with a mixed salad if you like. 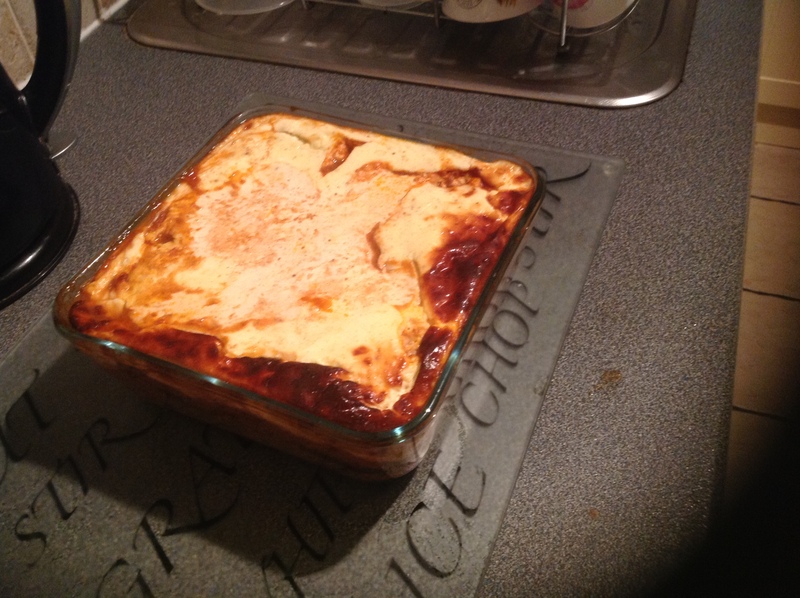 This was one of the first dishes I made when I started going to Slimming World. I joined because I love their attitude to food I don’t think I ever thought about the amount of fat I was using in recipes. They say that is what gives the food flavour but time after time I have proved that to be wrong. Nowadays I only ever use spray oil sparingly and the food still tastes wonderful. By my calculations this works out at just 3 Syns per person but please check this is right. This will not make any sense to those not on slimming world but suffice it to say it is very low fat and healthy. Here is the recipe. Spray a large non-stick skillet with oil. Fry the onions and bacon over a medium heat until the onions are tender. Remove and set aside. Spray a little more oil into the pan and fry the chicken in batches until brown on all sides. Return the onion and bacon to the pan with the garlic, flour and brandy. Stir and cook for 1 – 2 minutes. Add the mushrooms, wine, stock, herbs and seasoning, stir well and bring to the boil. Reduce the heat to low, cover and simmer gently for 45 minutes or until the chicken is cooked through. Check the seasoning and serve with potatoes and vegetables of your choice. Beef casserole, perfect for cold winter days! There are so many things I love about autumn and winter. The dark nights when you can snuggle down in front of the fire, warm milky drinks to take to bed, long walks, wrapped up in scarves, gloves and hats and last, but definitely not least, thick warming casseroles, full of goodness and comfort. I have been making this casserole for as long as I can remember. My Grandma used to make a casserole out of ‘leg meat’. I’m not really sure what cut this is, maybe it is peculiar to Derbyshire butchers. I’ve often asked for it only to be given a blank look. I have a feeling it is shin of beef but cut long ways instead of across. Whatever it was, she used to cook it simply in water with maybe a bit of salt. The result was incredible and the gravy to die for. Oh well, enough of my memories. My version always uses braising steak. Over the years the recipe has evolved. Initially I would cook it like my Grandma, then, when we had the children and money was short, I started added vegetables to bulk it out. Since then I have taken to adding some chopped tomatoes which give a great consistency to the gravy. What we eat today, therefore, pays little resemblance to my early offerings but the flavour is simply delicious, accompanied by a big helping of mashed potatoes to soak up the gravy. Preheat the oven to 180C/170C fan/gas 4. Spray a large non-stick ovenproof casserole with a lid with the oil. Don’t worry if you don’t have one, simply make in a large frying pan and transfer to your casserole when it is ready to go in the oven. Brown the pieces of beef over a high heat. The intention is to sear the meat and retain the flavours. Do this in batches if necessary as you don’t want the meat to steam instead of searing. When brown remove and reserve. Spray the same pan again with oil and add the onions and carrots. Cook for a few minutes until they start to go a light brown. Add the tomatoes and water and crumble over a beef stock cube. Season well. When boiling return the meat to the dish with the bay leaves. 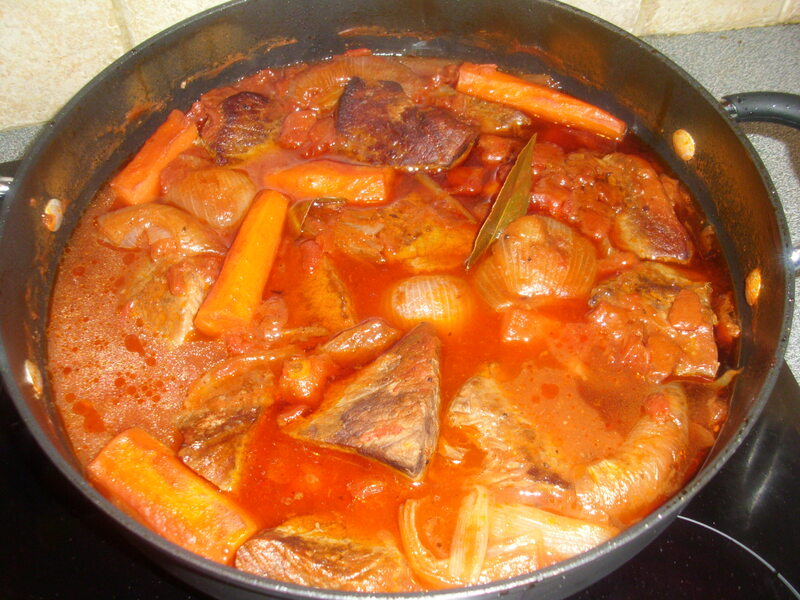 There should be enough water to almost cover the meat and vegetables but not drown them. If not add a little more. Cover the casserole and cook in the oven for 2 hours, checking every now and again to make sure it is not going dry. Check the meat is tender, if not give it another half an hour. Remove from the oven and serve with mashed potato, pouring the lovely gravy over them. 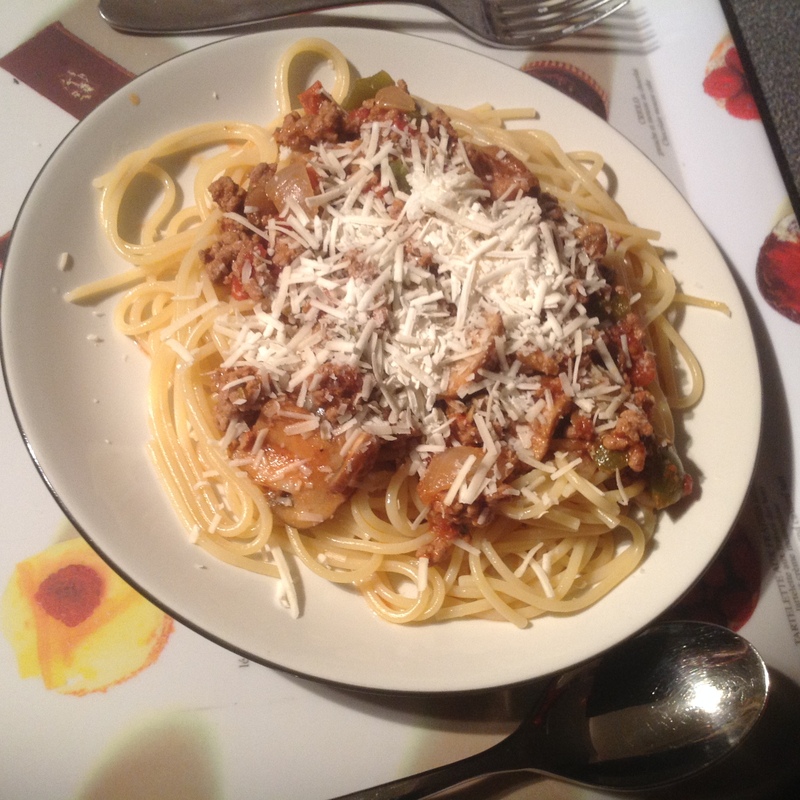 Spaghetti Bolognese is probably my husbands favourite meals. My version is not typical of a traditional Bolognese sauce as when I first started making it, many years ago when the children were young, I had to bulk it out with vegetables to reduce the overall cost and also to provide vegetables for my resistant children. We still love it and have it on average once a week. Now there are just my husband and myself at home I still make enough for four people and simply freeze half in a rigid container to use when time is short or when I don’t feel like cooking. Defrost completely though before you reheat. Recently I have been attending Slimming World to lose some weight that has crept on over the years. I have adapted the recipe so, by my calculations, if you use the Frylight oil, it is now Syn free. In fact, so is the pasta and, if the Parmesan is used as a Healthy Extra, that is free too. A wonderful plateful of free comfort food, what can be better than that! Spray a large saucepan with the oil or, if you are not using the spray, add the oil. Heat until hot over medium heat and add the onion. Fry gently for about 5 minutes until starting to go tender. Add the garlic and fry for 1 minute more. Add the pepper and mushrooms and continue frying over a low heat for a further 5 minutes, stirring occasionally so it doesn’t stick. Turn up the heat to medium/high and crumble the mince over the vegetables. Mix well and cook until the mince has browned. Sprinkle over the oregano and season. Mix well then add the tomatoes and water. Crumble over stock cube, mix well then bring to the boil. Reduce the heat to a simmer and cook, uncovered, for 30 minutes until all the vegetables are tender and the sauce has thickened. Add a little more water if necessary. In the meantime cook the spaghetti as per packet instructions. Drain the spaghetti and serve with the meat sauce on top, sprinkled with parmesan if you like. Thai style beef and mango salad, one of our favourite meals! We first had this salad about eleven years ago, shortly after we returned from living in America. It has been a firm favourite ever since and we eat it at least once a month and more often if I think about making it. Although this is classed as a salad it could not be further away from what I grew up to understand salads to be, i.e. lettuce, tomatoes and cucumber! The tender chunks of beef, straight from the pan, absorb the hot and spicy salad dressing. 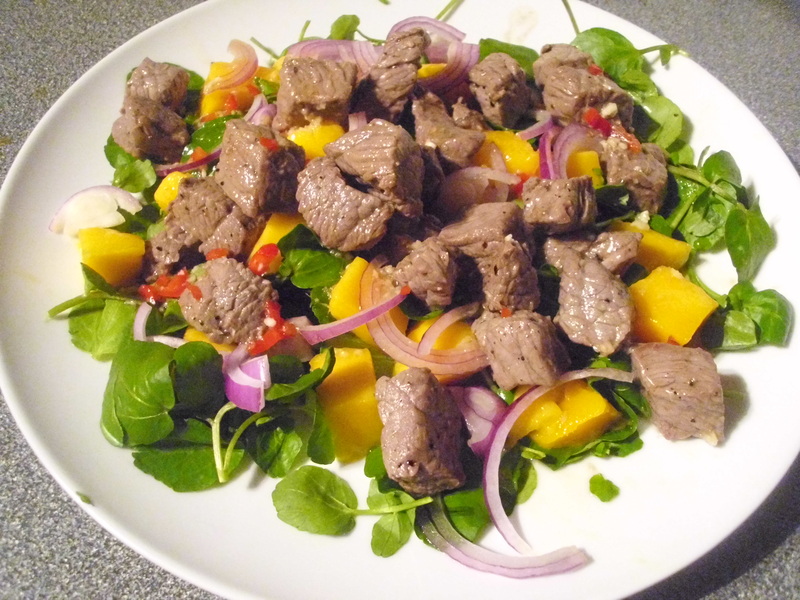 The sweetness of the mango is in perfect contrast with the beef and the heat from the red onion and the watercress. Your senses will rarely be subjected to such an attack on all levels, smell, taste and sight! Absolutely delicious and very low in fat, carbohydrate and calories so excellent for anyone who is hoping to lose weight. What more could you ask for? Thai food is known for its balance of the four fundamental taste senses, sour, sweet, salty and bitter. It is often spicy as well. This dish is an excellent example of how this balance is achieved. Don’t be put off by the ingredients, especially the mango in a savoury dish. If you like spicy food I think you will love this. Put the cubes of steak in a dish, add 1 tsp fish sauce and season well with freshly ground pepper. Mix well and set aside. Divide the watercress between two plates. Sprinkle the mango cubes and sliced onion over each plate. In a small bowl, mix together the lime juice, brown sugar, ginger, garlic and chilli. Check for taste. If it is too sweet add more lime, too sour, add a little more sugar. Just before serving, heat the oil in a wok. When hot stir fry the steak , turning frequently, until it is browned all over. Divide the steak between the two plates of salad and dress, to your liking, with the dressing. Serve immediately. 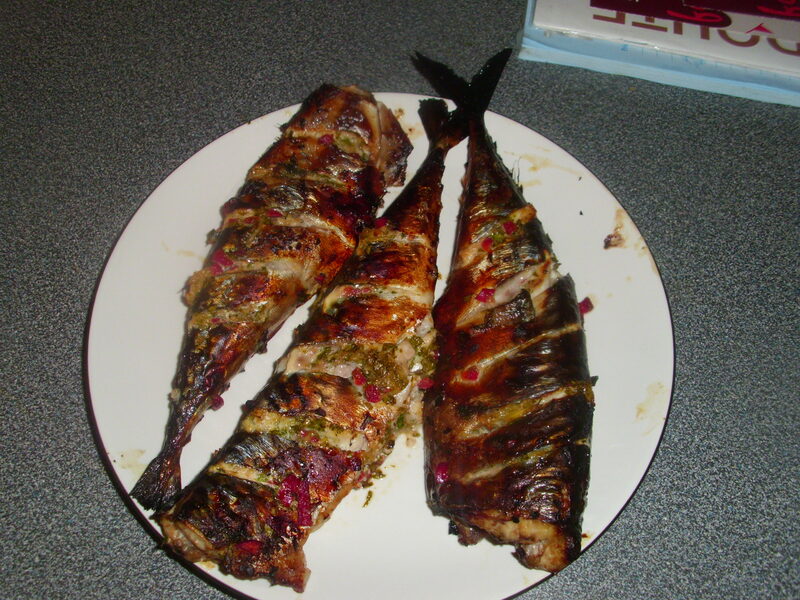 Mackerel with a Thai style marinade. I think Mackerel is probably one of my favourite fish. It is so tasty that I didn’t think a marinade would do anything for it but how wrong could I be! This marinade really enhances the flavour but is very subtle so you can still taste the earthiness of the fish. I honestly believe it is the best mackerel I have ever tasted. Next Summer I am going to try it on the BBQ. In the meantime it is fantastic grilled. You could serve this with potatoes and maybe a salad or green vegetables. One of Terry’s, my husband’s, favourite memories are when he left college and, before starting teaching, he and his friend Gus hitchhiked around Wales. One of the ports of call was Caldy Island where they caught Mackerel and cooked them on a wood fire on the beach. I bet they were fantastic! His friend Gus is a bit of an eccentric. He is always telling tall stories, I think he actually researches them! We often say he should write a book. Some stories that are true, however, are so funny. He went to visit Terry in College for the weekend and ended up staying for a whole term. He slept on someones dormitory floor, joined the rugby team and attended lectures. He even answered questions! No-one ever sussed it out that he was not actually a student. Thai cuisine balances four fundamental taste senses, sour, sweet, salty and bitter (optional). It is also spicy due to the chillies it invariably includes. Common ingredients are lime, chillies, garlic and ginger. Fish sauce is often included, usually offset by sugar. I found this recipe in the Woman and Home Dinner Tonight magazine and modified it a little. I’ve searched their website but could not find it so I will write it out for you below, along with the usual slideshow. It is worth looking up their website and getting their magazine, they have some great recipes. Anyway here is the one for today! Mix the chilli, ginger, honey, lime juice and zest and coriander together in a small bowl. Make large incisions into both sides of the mackerel. Rub the marinade all over the fish, making sure you get it some into the incisions. Put in a dish and cover with cling film and leave to marinade for 2 hours. Line a grill pan with foil and brush with olive oil to prevent the fish from sticking. If you are barbecuing oil a foil barbecue tray. Place the fish into the tray and cook on a medium heat for 5 minutes on each side. Turn up the heat and cook for a few more minutes on each side until the skin is brown and crispy and the fish is cooked through. Serve immediately. 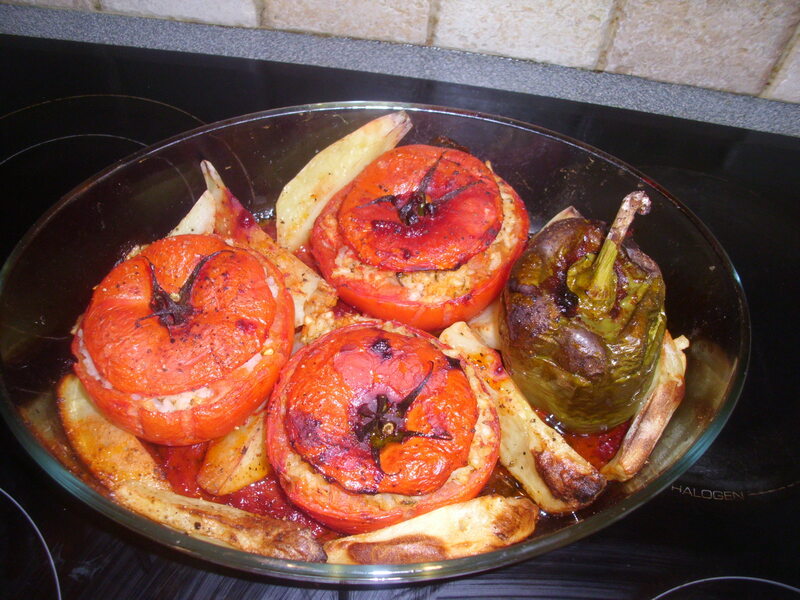 Stuffed tomatoes and peppers – a great veggie recipe! I remember the days when my husband, Terry, used to say he hated vegetarian food. That was before our son married a vegetarian, Tracy. Over the years I have made countless meals without meat and, with the exception of those using Quorn, Terry has enjoyed every one. I think perhaps our favourite is Stuffed Tomatoes. There are lots of variations of this dish. Some add minced meat to the stuffing, others, like my friend Maritsa, add roasted pine nuts and raisins. I make mine how my adopted YaYa (that is Grandmother in Greek) taught me, many years ago. Sadly she is no longer with us but whenever I cook this I have memories of standing in her tiny kitchen, working together and not understanding a word said between us. For those of you who have tried Greek cooking, it can be a bit of a hit or miss affair. Recipe books written by Greeks rarely give precise measurements and it can be frustrating when you have to decide how much a ‘bit of’ something actually is. This, however, is perfectly natural for the Greeks. If you ever get the chance, talk to a Greek about food. A light will switch on in their eyes and they will start talking with passion about a subject they love. Rena Salaman writes that cooking for Greeks is a constant reminder of who they are and where they come from. Recipes were rarely written down and so every household would have their own version of what is known to be a popular Greek dish. The one thing they would have in common is that the food would always be made of what is in season, and, most importantly, there would always be an extra portion, just in case there is an unexpected visitor. Such is the Greek hospitality! This recipe is Syn free if you are using Frylight olive oil and Food Optimising on the Slimming World plan. Wash the tomatoes, slice off the top at the stem end. Using a teaspoon, carefully remove the tomato pulp and reserve. Place the tomatoes in an ovenproof dish and sprinkle a tiny amount of sugar in each. Wash the peppers and slice off the top at the stem end. Carefully remove all the seeds and white pith inside and discard. Place in the dish with the tomatoes. Chop the tomato pulp. Lightly fry the onion until soft, in a little spray olive oil. Add the tomato pulp, the rice and the chopped herbs. Cover with cold water, about 1 inch above the level of the rice mix. Bring to the boil then simmer on a low heat until rice is tender to the bite and all the water has been absorbed. Keep an eye on it and add a little more water if required. Fill the tomatoes and peppers 3/4 full, top with a tablespoon of water and replace the lids. Wedge potato slices between tomatoes. Spray with olive oil and pour over the grated tomato mix. Season with salt and pepper and bake in a preheated oven, 180c/170C fan/gas 4, for 1 hour. Baste occasionally to keep the vegetables moist.